I've said this before. But it's worth repeating. Why can't other countries do what Steve Martin has started in the UK? First create a must-listen podcast for anyone interested in improving their radio production skills, whether it's public or commercial. And Steve has now gone a stage further by setting up a voice search scheme to find the best rising radio presentation talent. And the prize is being part of the Hobsons voice talent agency for a year. Radio needs to do a lot more to make it an attractive profession again. 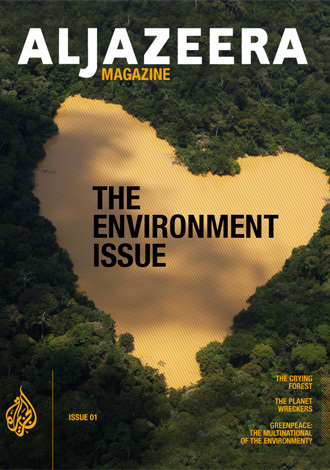 I especially liked this month's edition which focuses on creative storytelling in commercials. That is sadly lacking on many European radio networks. All we get in the commercial break is people shouting at us, trying to squeeze in a slogan or URL. Funny? Rarely. Memorable? No, or I would be able to quote an example. Most ads I hear are a cluttered rant -instead of having a clear message. They are not written for radio - its most pamphlet stuff read on the radio. You wouldn't come into a room full of people with this kind of stuff. So why are you trying it on the radio? Great contributions in this month's Earshot from Lenja Papp (in green above) who is a brilliant creative radio writer from Slovenia (the only country with love embedded in the name). In the podcast she explains how you can build an emotional bridge in seconds if you understand what the audience is thinking. There are great examples from Slovenia which make effective use of radio's intimacy. She is also a risk taker - organising a great campaign on behalf of a local charity to prove to advertisers that radio was still an effective medium to share their brand. 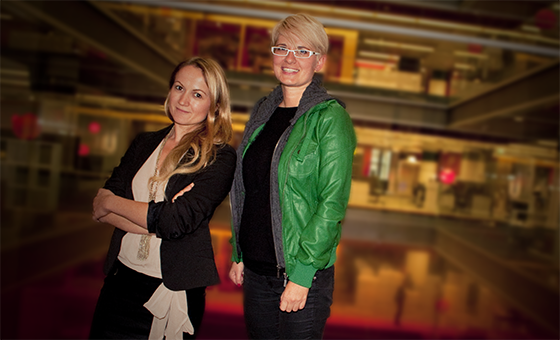 She also does pioneering work to boost local radio talent in Slovenia. She deserves to be a rising star. I thought the comments from Clare Bowen, (also pictured above) head of creative development at the UK Radio Advertising Bureau were useful as well.. She points out that advertising bureaus in the UK still regard radio as just a medium for something with a fast turnaround, not giving the campaign time to breathe. She's also doing pioneering work showing how radio is different, modern and relevant - if done right. I've been disappointed that other radio advertising bureaus in other countries are often there to defend the business - coming out with nothing more than listening figures. They need to explain to content creators how to engage with audiences if radio is to remain an effective part of the advertising toolkit. The RAB has great advice on their website for professional storytellers. Just look at this publication for instance. In all, we need less defensive thinking and more focus on creativity please! Can you imagine if a broadcaster did something different when you liked their site on Facebook? Kraft Cheese seems to have taken a leaf out of the Old Spice campaign from last year. But in a more tuneful way. Mind you the stuff they are selling ain't that healthy. I'm sure the singers don't eat too much of it. Forgotten Post - the BBG? The US Bureau of Broadcast Governors which overseas all federal and private international broadcasting like VOA, Radio Marti, Radio Free Asia and RFE/RL. 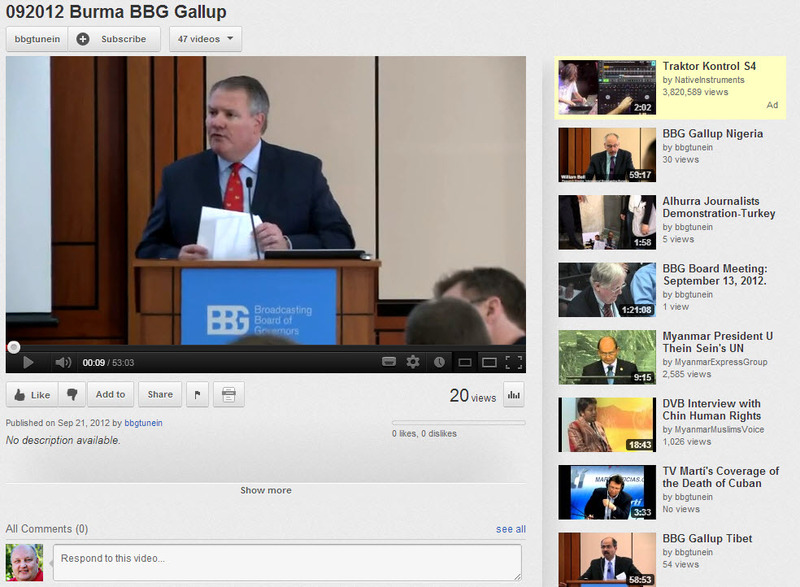 There are actually some interesting sessions to be found of the BBG Strategy Site, but I don't think anyone knows, judging by the number of views on YouTube. Also the BBG has commissioned extensive studies in Burma, discovering a rapid rise in the popularity of FM Radio. This follows the same pattern as in other countries (like most of Eastern Europe). VOA seems to have gotten some stations in Burma to carry English language lessons presented in Burmese. But news and current affairs programmes are still some way off. Again that video doesn't seem to have been discovered. The problem is that it's not in context on YouTube. Interesting to see how this start-up located in Cambridge in the UK is using sound analysis combined with video cameras to detect aggression and/or glass breaking. They spent several days smashing glass to make enough recordings to build a reference database. 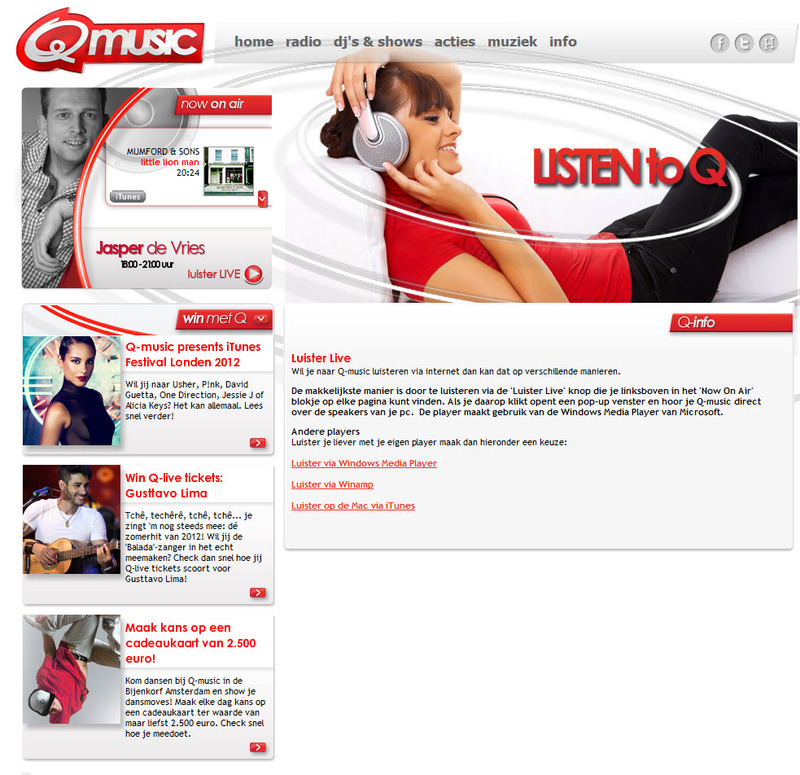 Joined up CrossMedia Q Music Netherlands? You'd have to be blind not to spot the busstop/train station campaign from radio station Q music in the Netherlands at the moment. They must have blown their annual budget to get all those outdoor spots. But when you go their website - do you get the next part of the story? No. In fact it's an old chestnut of a competition last used here in 2005 by SkyRadio. You had to recognise a sound of summer and SMS the answer at a premium rate. 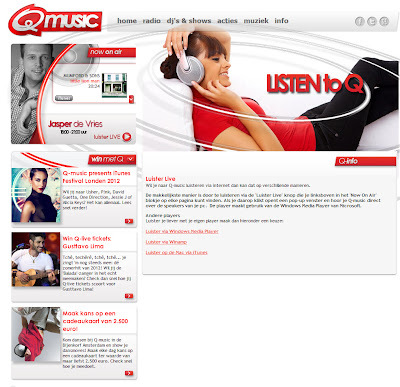 Q Music in Belgium ran it in 2005 as well, as did a number of German commercial radio stations. But this time the only call to action is to find them on the FM radio. And there's a big of augmented reality built into the poster, but frankly I don't think people understand. And why would you want to download a special app unless it would triple the prize money? Just bring the ad to life doesn't seem all that exciting. Sounds like these radio guys haven't really thought how their audience is using mobile media. Just marvelling at the creative ideas as to what the iPhone 5 could have been. I wish the phone could turn into a iPad just by pinching the screen with rubberband electronics. There were also plenty of parodies too. These are some of my favourites. Do people know what they are buying? And don't forget what mobiles looked like just 13 years ago. The Next Web did some interesting and useful interviews in Hall 14 at IBC a few weeks back. That included an interview with George Wright from the BBC R&D department. 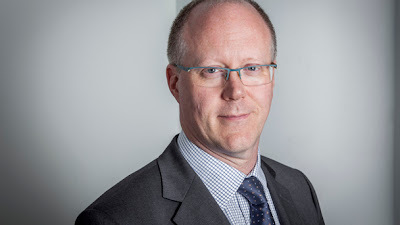 In this interview above he describes the challenges facing the BBC World Service in cataloging their vast audio archive of features going back several decades. Like most radio archives, the metadata (descriptions of what was on the tape before it was digitized) was very variable - most of it doesn't have much detail and some of the data is actually wrong. They are using around 300 volunteers in the Global Minds Audience Research Panel to help them with pilot tests to improve the metadata. Jamillah Knowles wrote the following as a result of doing the interview with George. The International Broadcasting Convention (IBC) took place recently in Amsterdam. Throughout the event, The Next Web streamed live interviews with industry players with the help of LiveU. The BBC was present at the convention doing some great work with archives. George Wright, Head of Prototyping, BBC Research and Development and his team are working with sixty years worth of World Service archives, that’s around 500 terabytes of audio. The aim of the work is to help users find what they need more easily. The historical importance of the collection is considerable and it will become far more useful once it has been properly tagged with data that is searchable. The archives have almost no metadata, so the team has created a speech recognition system which goes through the archive and adds tags so that users can navigate. Along with the machine recognition, listeners are volunteering to correct and add tags to ensure that it is all correct. The R&D team at the BBC built its speech recognition system on top of existing open source software. The audio from BBC World Service has its own idiosyncracies that make speech recognition a tricky prospect for accuracy. If you have heard past broadcasts from the global radio network, you’ll spot that people spoke English in a quite different way in the 50s in comparison with the language used today. Add this to the difficulties in recognising proper nouns and foreign place names and you can see what the software is up against. Once the material is properly tagged, it can be used in a number of ways for re-broadcasting, primary source research and to add value to future broadcasts. The archive material is mostly programming and features rather than news reports, but the standard of interviews and the historical value of the archive is unquestionable. I think it is interesting to connect this to a group which won one of the Knight Foundation grants on Saturday at the Online News Conference in San Francisco. Pop Up Archive from Mario Furloni on Vimeo. The Popuparchive seems to be tackling similar problems, but then with audio content being recorded for production houses working for US National Public Radio. "At its core, Pop Up Archive addresses the challenge of enabling any producer to share digital audio content in ways that are meaningful and useful to the public, without the need to employ an archivist. The system also provides a well-documented method for independent producers to store and access content: media files are seamlessly uploaded to the Internet Archive for permanent preservation with the option of social sharing through SoundCloud, all at no cost to the user. 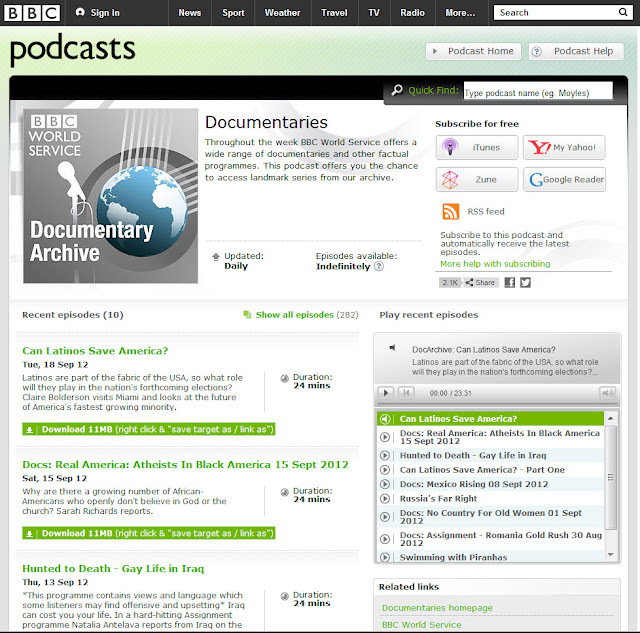 The initial phase of Pop Up Archive resulted in software plug-ins scheduled for summer 2012 release through Omeka, an open-source web publishing platform. 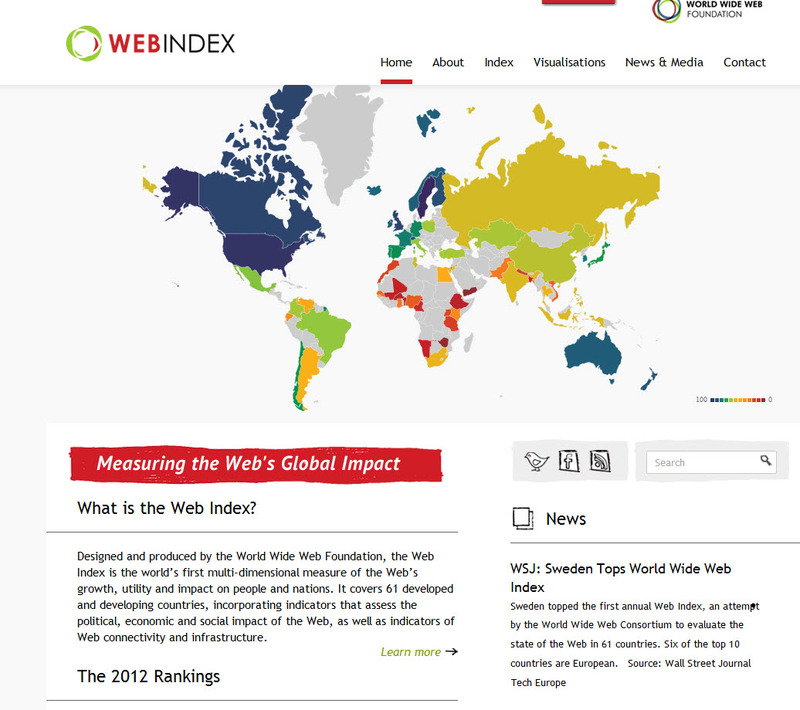 Phase two of the project focuses on data standards across organizations and web service needs. Pop Up Archive addresses the growing desire in public media to engage with audiences online in new ways. Our system reinforces existing audience participation habits and encourages new forms of participation, including re-use of content by other independent producers and oral history collections that may lack institutional support and resources. Allowing listeners to help organize content enables producers to understand how audiences interpret their work. At the same time, we recognize the importance of the authority upon which archival descriptions are historically based. To that end, files are catalogued with authoritative metadata in accordance with recognized public media standards. I have been working with a couple of start-ups this week who both have fallen into the same trap. Asking a websdesigner to make them a site before they have worked out what it is they are doing. As a result, they have a fantastic flashy website which attracts no-one. There is no story, therefore no point, even if it looks like it cost a million dollars to build. No great shows were made by recordings the sound effects (or the music sound track first) and then writing a story around it. If I am ever asked to explain this I always reach for the brochure produced by the Rotterdam architects van den Broek and Bakema. They were commissioned by Henk van den Broek, the first director, to design the new Radio Netherlands building on the Witte Kruislaan in the late 1950's. 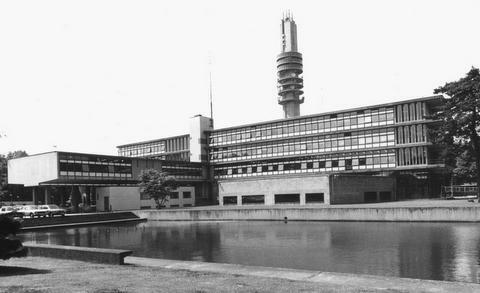 It was the first radio station in Europe where the architects had designed the building specifically for its intended purpose - the centre for Dutch international radio broadcasting. The plans drawn up in the 1950's were only partly realised in the 1960's. It was only phase one. Though the sugar bags in the station canteen had a picture on it showing the full plan with the extension built. In 1989. they found the 8 million guilders to build the second phase. The architects bureau made a brochure to celebrate the event. As someone who worked in the building I could see the brochure was clearly design led. 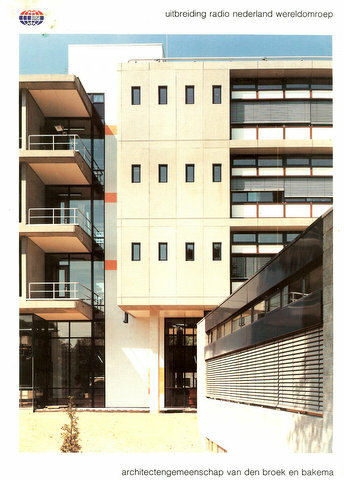 Because those rows of 12 windows featured prominently on the front cover of brochure are actually the toilets. The great demos of how to use visual effects continue over on Red Giant. Order Up from Red Giant on Vimeo. Got a useful demo at the recent Amsterdam Supermeet - the holy grail of editors meetups. Amsterdam Supermeet 2012 - Simon Walker demos Red Giant Software from Gert Kracht on Vimeo. Been working with some radio stations in Africa that have gone through severe funding challenges, to a point where they have had to re-think everything from scratch. The biggest challenge was not introducing the new ideas, it was getting rid of the old ones. In this case, the new station was not a smaller version of the old broadcasting corporation. Once that was established, discussions become so much more fruitful. This is one of the most important lessons learned from the new course by Steve Blank which recently went on line. One of the better episodes of the weekly show, especially the discussion about Twitter. Some excellent (free) advice in this on-line series of lectures from Steve Blank, one of the co-authors of the The Start-Up Owners Manual. These modules are 20-30 minutes each. But they are more than just a passive course telling you what to do. They are a great catalyst for the serious entrepreneur. It's a case of watch, consider and then just do it. One of the best public resources in years. I would recommend that as well as getting the books on the reading list, try the Business Model Generation app on the iPad. Because you can adapt the app to fit your business idea, not theirs. 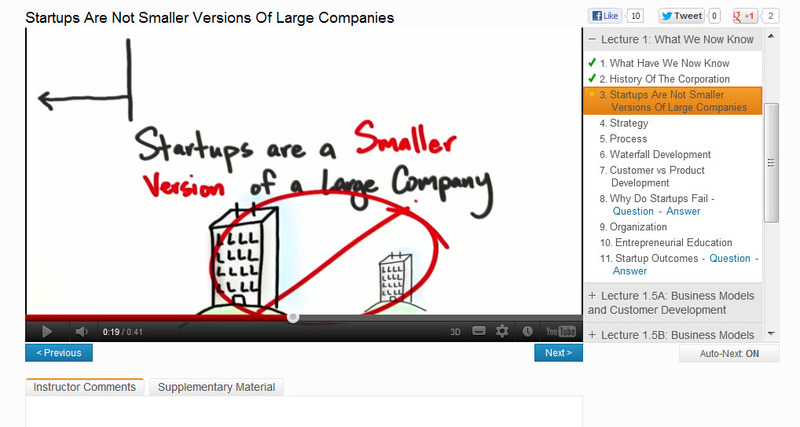 They seem to have built it quite simply, posting the video to Youtube and building a course page on the Udacity site. Rather than talking (endlessly) about how education needs to change, these guys are just doing it. The course you want is EP245. Woke up this morning to a couple of email's saying I should check out Radionomy, a Brussels based start-up from 2008 who have relaunched their on-line radio platform at an NAB radio event on September 18th. Good job I can understand enough French to work out the press release. Their website is a rather chaotic mix of French and English. They need to fix a lot if they are to have any impact with those who have enough trouble with one language. Radionomy isn't radio, at least by my definition. It's a method to create and craft your own playlist of music from someone else's database and stream it to your friends; in fact anyone who finds your "station" in the directory. Unlike rival Shoutcast, you can craft your playlist, mixing the levels of your music and deciding on the frequency of rotation. We're told there is even an option to inject live content (announcements) into the stream, though with the latency of the web, it will be interesting to discover how that works if you are in New York and the server is in Europe.They claim on the website that there are 6000 such radio stations in the directory of 80,000 songs. In an article published this week, the number is given as 7000 stations. - 13 million unique listeners. Actually I find the whole thing to be more like Flickr for audio rather than a radio player. You're building collections of music you like so that others can hear. So why would you want to do that? To start a conversation with friends? I can think of better ways. Radionomy is a bronze sponsor of LeWeb in Paris. They built a studio at the three day fair and "broadcasted" live interviews back in December 2011. Can we dip into that collection of interviews? Not easily. So what am I adding of value to the site as a "radio station manager". Actually, it's only a playlist. I don't own the music. If I hit on a winning compilation formula, I can't copyright that mix or export it if Radionomy goes away. Perhaps you want to make a little money by showing off your compilation or curation skills? In that case you have to build an audience in order to continue to host your compilation for free. Popular "stations" on the service carry 4 minutes of advertising an hour. Radionomy may share the revenue with station programme managers "under certain conditions". The vice-president of business development, Thierry Ascarez, told Evolver.fm this week that can be up to US$5000 a month. But That sounds like good money for programming someone else's radio station - but I guess it is an exception rather than a rule. Personally, I wouldn't give up the day job just yet. For they point out two conditions of use. Advertising - Radionomy broadcasts advertising on your radio station and may share revenue from it with you under certain conditions. So how will they make money? Another part of the site, called Adionomy, tries to explain. 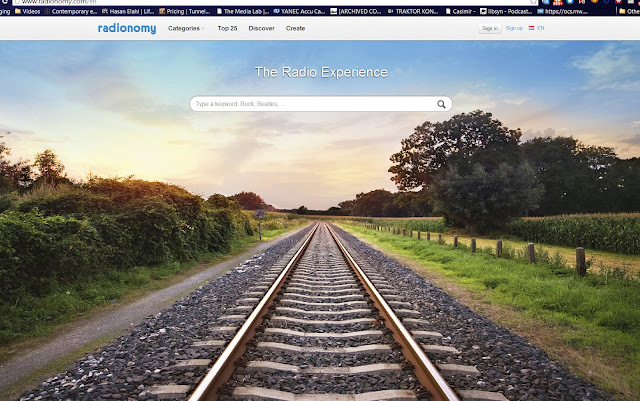 Unlike traditional FM radio, Adionomy lets you precisely target the people you want to reach. Your advertising targets the profile type and geographical location of the listeners you choose. Choosing Adionomy means choosing your target and improving the price per profile per power. Actually, local FM radio is pretty good at segmenting an audience. Radionomy don't seem to answer the question as to why a (local) business would want to get its message out to listeners all over the world. It was the mistake that Worldspace made. Most radio advertising is to tell you about a product that you'll want to pick up locally. And what exactly is the price per profile per power? The burn rate of this startup seems to be rather high. In the French language Fast Facts is the statement that they have "received a total of 6 US$ million to date" to create this solution. Sounds rather a lot to build a database. The money certainly hasn't gone into creating clear marketing materials or a coherent story. When I worked in radio, I quickly learned it was not about the technology. It was about a shared experience between passionate people. It was all about the conversation and understanding an audience need. I can't find the conversation inside Radionomy. Many of the beautiful cover shots on the home page are strangely lacking people. Which is why, for me, Radioonomy isn't the radio experience it claims to be. It's the User Experience Stupid! Why is Radio Sleeping? Bumped into this excellent explanation by James Cridland of what's wrong with radio's digital interface. It was actually given in September last year, and posted in July 2012. It is rather buried on YouTube but it has no right to be. Been thinking the same thing - radio interfaces have fallen well behind the times. In fact I think there's a connection between radio's hybrid future and the new magazine that Al Jazeera has just launched in the Apple App Store. For Free. Al Jazeera English is still very much a satellite TV network which has an on-line department. They make some great documentaries, but the context in which you find them on-line is often confusing. It's actually an app which puts some of Al Jazeera's documentary content into a new thematic context. Well worth playing with. It isn't perfect - the integration with YouTube pages is rather clumsy (you jump from one design into another), but it works. It's certainly well ahead of some of the apps and digital publications the BBC has put out for its global audience. 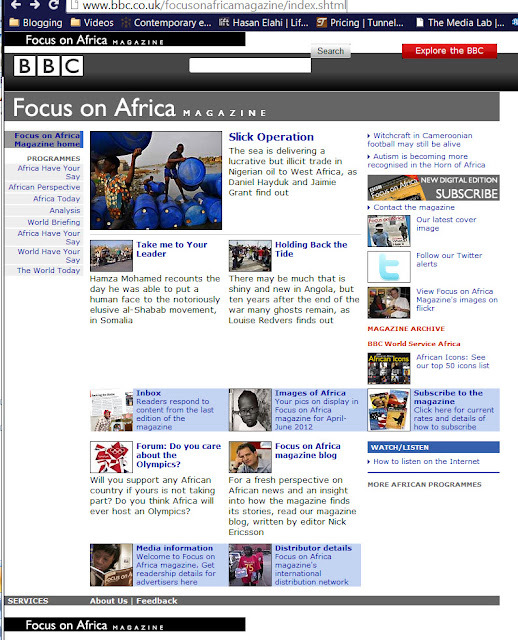 It's what Focus on Africa magazine should have done two years ago. . In fact, I just cancelled my subscription - Some great articles but I just don't need any more paper. The website snapshot was taken a few minutes ago. Looks like the BBC in early 1999, except for the reference to Twitter. I'm afraid the Digital Edition of Focus on Africa Magazine is not a patch on what Al Jazeera is giving away for free. Apart from a profile in each recent issue of a BBC African partner station, the BBC magazine seems to be totally divorced from the content of either BBC World Service and BBC World News. Now suppose World Service made a hybrid app like Al Jazeera's so we could access some of the brilliant archive of radio and TV documentaries. They spend a lot of money making great investigative journalism, which then become buried in a page that reminds me of a shortwave broadcast schedule. I love the button to download the documentary to my Zune. Zune is finished...watch it disappear with the launch of Windows 8. Oh dear. I read and revisited two interesting, yet unconnected speeches today. I'm the one making the creative connection. 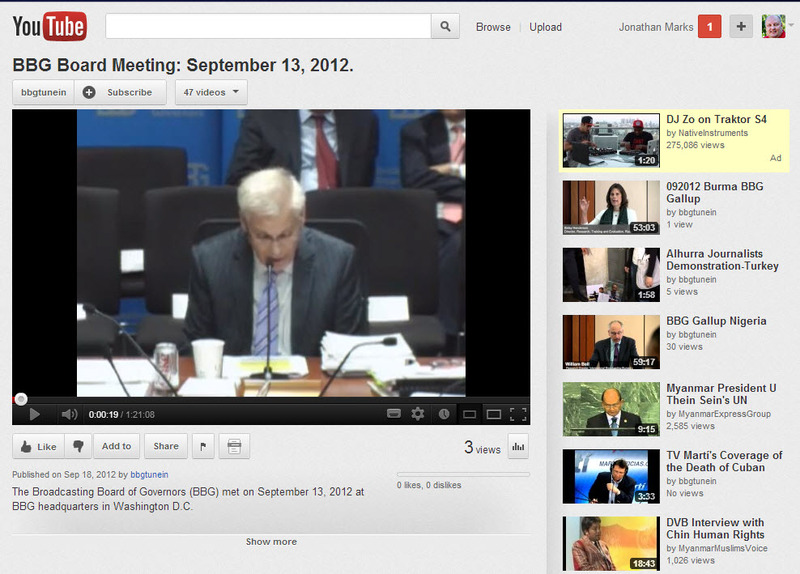 The first speech comes from George Entwhistle, the new Director General of the BBC. The full text of his address to staff today was published on line. It is so refreshing to hear him speak in the creative language of production. As broadcast becomes only one way in which the public access programmes, you can see the challenges facing all parts of the BBC. But it's a great start. These were the bits that struck me most. I’ll start with what I think the BBC is for. When you strip it down to basics, our purpose isn’t complicated or challenging. We have a time-honoured compact with the UK public. In return for the licence fee, our task is to bring output of outstanding creative originality to as many people as we can reach. Reith’s famous mission statement commits us, I believe, to all the genres in which we seek to do those things today. To news and current affairs when we set out to inform; to the full panoply of factual output and our children’s services when we seek to educate; and to music, sport, entertainment, comedy and drama as we strive to entertain. At our best we often deliver all three parts of Reith’s vision in every one of our genres. But I want to focus here less on our breadth and more on the essence of what I believe we’re about. Our task is to serve the public, who pay for us, and whose licence fees make us independent. Our independence from everyone except our audiences gives us one core responsibility – to deliver content of outstanding creative quality whenever and wherever we can. So if we’re clear about what we should be trying to do, the question that follows is obvious. How are we doing? But does all that mean we’re already there? Does it mean, as some of the pundits have written, there’s nothing for me to do? That’s not how it looks. I believe that meeting our side of the deal with audiences demands even more from us. They think our programmes and content are the most original and of the highest quality they’ve ever been. But there is still a gap between how they rate us now, and where they expect us to be. And though, as I’ve said, our best is often brilliant – in some of our output, we do settle for less than we should. So I believe we owe our audiences a determined effort to raise the creative quality of what we do. We’re not used to hearing this. I’ve been guilty at times of presenting the best as representative of the rest. But I think it’s time to admit to ourselves we can do better.I don't mean by that, we can't afford for anything ever to go wrong. We just won’t be trying hard enough if nothing goes wrong. But I want everybody in the BBC to ask themselves this: am I using the extraordinary gift of public trust and public money to be original enough about the things I produce? Am I doing enough to challenge, lead, surprise and delight the people who pay for us? I want to show you how I believe we can make the BBC a more creative place to work.Over the next couple of years, a combination of events we’re creating ourselves and events we know we’ll be covering will give us the chance to take the Olympics formula and make it work again. In 2013 – the 50th Anniversary of Dr Who; a TV and radio focus on music, including Glastonbury; BBC Two’s Year of Invention; Wimbledon with our new grandslammer Andy Murray; and a possible Natural History Unit Summer of Wildlife. In 2014 – the output we’re already planning for the 100th anniversary of the start of the First World War; the football World Cup in Brazil; the Winter Olympics in Sochi; and the Commonwealth Games in Glasgow. Every one of these – to a greater or lesser extent – is an opportunity to apply the lessons we learned from the Olympics about how to work with one another – and not place the narrow interests of programme, channel or service ahead of those of the audience. How to collaborate to make output events bigger, bring more people into the frame and once again make the statement: only the BBC can do things with the ambition, scale and quality that bring the whole nation together. But setting your creative sights as high as possible is only one side of the deal. The side I have to deliver is making sure I turn the BBC into an organisation where creative success never has to be achieved in spite of our structure or management. Starting today, I intend to change the way we’re led to put the emphasis where it belongs – on creative people doing creative things; on our audiences and the exceptional quality of work they deserve. To be successful, we have to restore creativity to the heart of the BBC’s internal conversation. That means spending more time talking with our colleagues about what it is we produce and how we do it. It demands honesty, trust, openness and the willingness to share ideas if it’s to make a difference. I want to spend as much of my time as possible hearing people talk about how they tackle their creative challenges and what help they need to do so more effectively still. In my time at the BBC, I also worry that I’ve seen the quality of our own critical conversations decline. I’ve seen a culture emerge where only the experts are encouraged to say what they think. This isn’t healthy. I want to turn to the financial challenges we face. Please don’t think I’m asking you to find this new focus on creative excellence oblivious of our financial circumstances. We still have a flat licence fee settlement; we still have important and expensive new commitments. Sadly for me, changing DG doesn’t make all the tricky stuff go away. But I want to take a moment to say how proud I am that we will soon be funding the BBC World Service from the licence fee. It is in many ways a perfect distillation of BBC values – an ambassador of fairness, accuracy and impartiality to the whole world. I believe no longer being directly state-funded will be to the benefit of its reputation for independence. But more broadly speaking, it just isn’t possible to change the financial fundamentals. And even as we strive to absorb the 16% cut we planned in DQF, we must not turn our backs on the opportunity we have – secured by the certainty of our funding – to go on producing amazing things. We must not waste time lamenting lost budget. The key to reconciling these two issues is to ensure the money we do have is focused exclusively on output. In the last few months we have renegotiated a series of major infrastructure contracts and in the process saved tens of millions of pounds. The key to money in future is not to waste a penny. But our finance specialists aren’t the only people who know where inefficiency is and where savings might be made. Secondly, we have to be clear about making sure responsibility for spending and saving money is pushed far enough down the organisation, with our people trusted to spend wisely. I believe we have to empower people to save – all our people. I believe we will encourage them to do that by allowing them to keep some of what they save and give it back to their audiences in the shape of better-funded output. 2. Creative Darwinian Speech at the Amsterdam Supermeet. IBC is a technical circus. Nearly 50,000 people gather in Amsterdam every September. Each is somehow connected with content production and/or distribution. During the International Broadcasting Convention, there's a meeting of craft editors in the Kransnapolksy Hotel on the Sunday evening. This year it was September 9th. It used to be the Final Cut Users Group, until Apple messed with its video editing program last year so that most people are defecting to something different. Supermeet is backed by a whole bunch of interesting alternatives to FCP, mostly used to make anything from TV dramas to motion pictures. And most of the software costs the same as you would have paid for a simple audio editor for radio just five years ago. But with this year's Supermeet, there also came a warning from Michael Cioni from Light Iron, who works with some of the top (movie) post production houses in Hollywood. Some important messages to creatives in broadcast production. If time is short, scrub through the preamble and start two minutes in. Michael pre-empted the official announcement by Fuji that they are ending their film business. Not in a couple of years. In a matter of weeks. And what he says about on-set post production rings very true in my ears. I'm puzzled as to why Accenture commissioned these videos connected with their Netherlands Innovation Awards coming up in the course of next week. This video says absolutely nothing (other than jury members seem to be meeting to choose winners). Does it help Accenture to create a buzz? Er no. So where is the story? May be the innovation problem is more on a national level. According to the OECD, the Netherlands has a knowledge economy that functions well - but it's operating at a very low level compared to other countries. In 2010, the Netherlands devoted 1.85 per cent of the GNP to research and innovation, the same level as 30 years ago. For every 1000 employees, just 6 are employed for research and development, well below the average for the majority of OECD countries. As this country has few natural resources, this figure should be sounding alarm bells. It's no good just been good in sales and marketing. Currently consulting to several African radio stations. 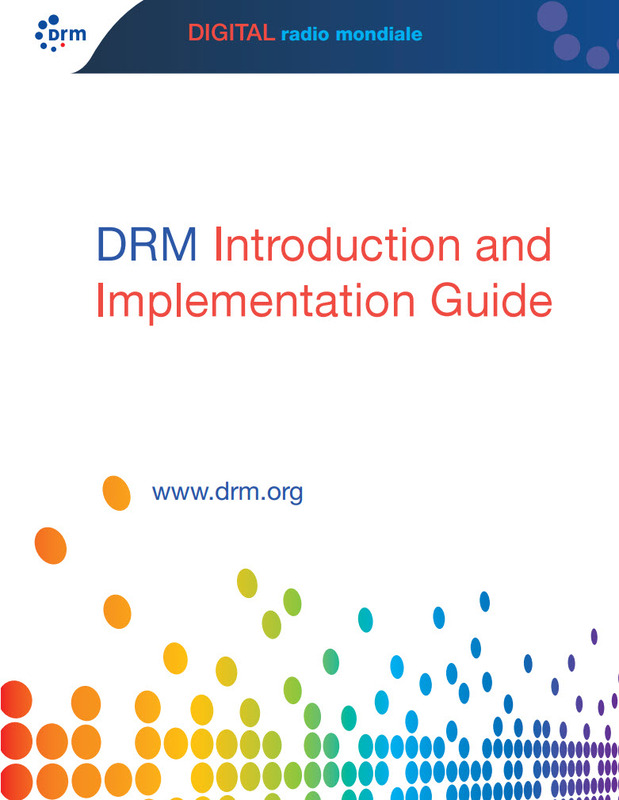 The subject of DRM came up. Are these guys serious? Yes, they have been serious since 1996. That's the clue to the problem. AM broadcast facilities are being closed all over the planet, Not just mothballed - but demolished as it becomes uneconomic to use 500 kWs to blast just an audio signal across a border when satellite television has a much bigger audience impact. We live in a visual world. And for the 8 or so countries where shortwave remains the only way to reach rural areas (Somalia comes to mind), these places will never go to digital SW. Remember these international networks were designed when oil was 40 dollars a barrel. Now the cost per listener is bonkers. The user interfaces of most DRM receivers are poor (on the level of physics experiment)- and there are huge challenges to build the antenna into mobiles. The technology works. But is there still a need? Not in my recent experience. The window for Digitale Radio Mondiale has closed as a stand-alone technology. How long will they struggle on? Troy Library from Jennie Hochthanner on Vimeo. Few people knew that Troy, Michigan even had a library. This clever and cheap campaign saved it from closing - and got 103,000 views on Vimeo for a very local issue. Currently looking at the economics of setting up a radio station in South-East Asia along similar lines to Radio Bario highlighted in the video below. Low-power FM radio stations cost a fraction of what they used to. For communities where a language is spoken by only a few hundred thousand, there will be never be a business model for a full-service TV station in those languages. It will be a long time before these stations think of going digital. 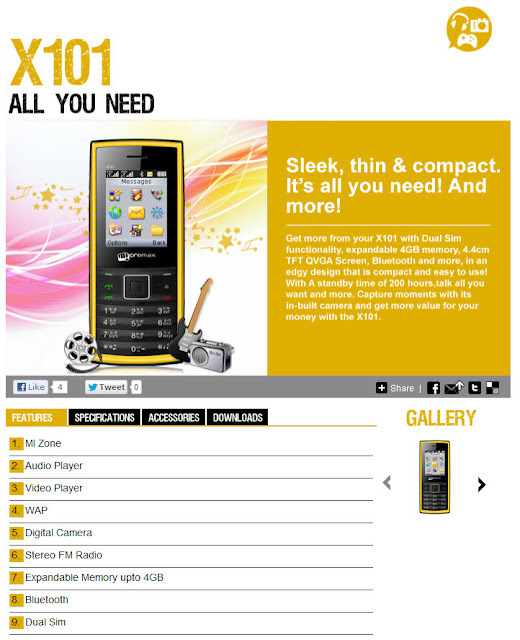 FM receivers are built into locally available smart and feature phones. That integration is going to be essential for radio's future. 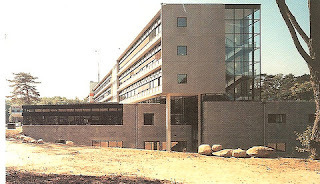 Michael Rosen: Prose poem for BBC Bush House: "
tape to deck. Great writers fell out of my mouth. I coughed. Go back. Redo that para. Centuries pass. Tom Paine. Amy Tan, that sort of thing. And then nothing. I go into the operating theatre. The surgeons look up and nod. I back out. Don't want to breathe on the tape. Coming out. I hope Security don't notice. Oh no, they have. 'One moment, sir. Why have you been in there?' 'I don't know.' Outside, the buses are racing. The drivers know where they're going. The 4 from Waterloo to Finsbury Park." Nice Poem about recording in Bush House in the middle of the night, so the world could hear. London, 11 September 2012: IBC today announces its attendance figures from IBC2012 which took place in Amsterdam between 6 – 11 September 2012. As the exhibition closed at 16:00, the number of attendees – conference delegates, exhibition visitors and exhibitors – was 50,937. This compares with the record year 2011 which had 50,462 attendees, showing a growth in 2012 of 0.93%. And so another International Broadcasting Convention (IBC) in Amsterdam comes to a close. The tannoy has just announced it's over for another year and that visitors need to leave now so the break-up crews can dismantle the stands. That bit is always a challenge for those running their own stands, as there always seem to be stairs that have to be negotiated. The headline is that there has been a 0.9% increase in visitors this year. Wow - is that news? Personally from chatting to people (and arranging appointments) I got the impression that people came to IBC for a shorter number of days this year. IBC doesn't have the statistic because they don't measure when you leave. So we will probably never know. I've found IBC 2012 to be interesting - I have had some really useful conversations and done some excellent interviews (more later). But logistically it was an extremely frustrating visit this year. I thought that now the building work outside the RAI has finished, IBC might be more inviting. I was wrong. I definitely see the IBC struggling to integrate "connected new media" into what is a very traditional broadcast hardware and software show. Started by the dedicated hardware specialists, its clear that the software guys are the people making the most of innovation. Although they keep repeating that this show is about content, management and distribution, the focus is still mainly on the making and distribution of mainly linear live content. I went to watch several demos on stands in the Connected World Hall 14 (does that mean the rest of the IBC is disconnected?). This tent stand is clearly the ugly duckling of IBC, literally being in a world of its own. I feel that's a great shame as many of the topics being raised in Hall 14 are having a major impact on companies in Halls,1, 7 and 2. I thought the navigation around the myriad of small stands in Hall 14 was awful and confusing. And the stands were not clear from the signage as to what problems they were solving. Very difficult to work it all out. Many of the people I spoke to were complaining of the poor connectivity on the stands, being charged outrageous prices when compared to the competing event - the NAB in Las Vegas. LiveU was able to do live 4G reportages from the floor of NAB. Something similar from the floor of the RAI they told me is simply Mission Impossible. Forget Wifi at IBC. There are so many devices in the area that it just falls over. There seems to be a competition for giving out the most prizes. 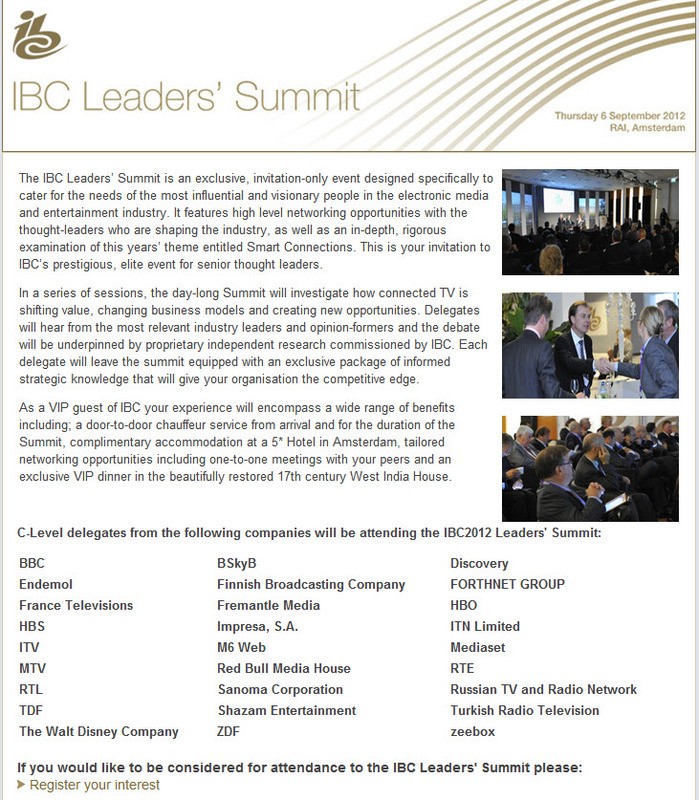 IBC and the International Association of Broadcast Manufacturers (who back IBC) now seem to have rival prize-giving ceremonies. As a result the "prize" is devalued into a bit of PR. I saw far too many prizes being dished out this year for categories I didn't understand. My personal vote for brilliant marketing goes to GoPro. They gave away a few small (brilliant) HD cameras once a day at 3 pm. There were queues of people on the stand for most of the day waiting to enter their details in the draw. So they got the visitors to do all the admin work (no silly barcode scanners here). And what seemed like over 100 people came to the stand in Hall 9 for the Go-Pro rally and draw at 3 PM. The staff motivated the crowd to shout "Go-Pro, Go-Pro, Go-Pro" at the top of their voices. They made such an impact that IBC officials came over to investigate on subsequent days. They were allowed to "make noise for just 10 minutes". It seemed a camera manufacturer (Pana.....) in the same hall had complained. Yet another stand next to Go-Pro were much cleverer, bringing forward their drinks reception to 15.30 when the Go-Pro guys had finished. - Don't try to beat them - join in the euphoria they were generating. Go Pro were one of the few exhibition stand holders who make stuff so cool that users make all the promotional videos for them. And they put really cool stuff daily onto Youtube and Vimeo to prove it. And then there is all the unnecessary walking. Someone decided to close the back entrance to the RAI city from the Beatrix Park. I noticed that the delegates staying in hotels on that side of the RAI quickly decided to enlarge a hole in the fence. But what was the council or the RAI thinking? How can we complicate the visit as much as possible? Dutch railways gets my golden raspberry award for not only cancelling trains to and from Schiphol on Saturday and Sunday, but also disrupting traffic on other sides of Amsterdam. This show is the LARGEST conference and exhibition the RAI organises each year. Clearly that message hasn't got through. Best coverage of IBC this year was from independent sites like BroadbandTVNews and The Next Web. I saw some very strange headlines on the IBC Daily News(paper) handed to delegates as they come in. Georgian Public Broadcasting Goes Tapeless! Loudness a challenge for radio! (I always say no thanks because I don't want to carry a wad of paper around all day). 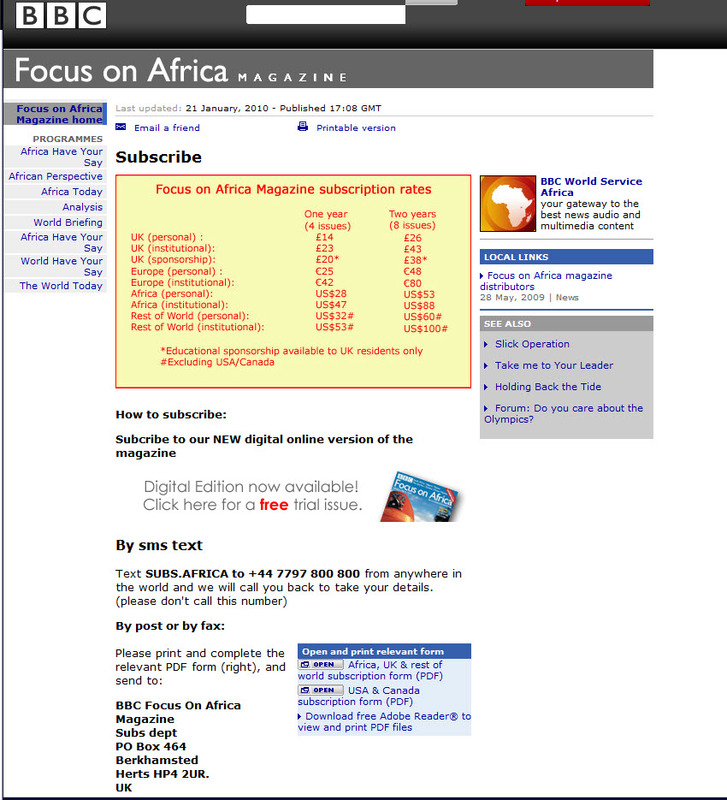 So why is the IBCDailyNews website still not showing the PDF version of the 2012 issues? Where were most of the creative editors this year? At Dam Square on Sunday evening for the annual Amsterdam Supermeet. Definitely the best offsite event for creatives - knocks anything similar at the IBC Production Village for six. But let's keep that a secret. Humourous - but also very practical demo of the new version of Adobe Premiere CS-6 by Al Mooney. One by one what's left of Radio Netherlands transmitter network is signing off and going away. The Radio Netherlands Caribbean service closes at the end of September, though I note a series of anonymous posts on the same website saying "so long and good riddance". I guess that must be a political propaganda I don't think it does justice to the range of programmes made by former colleagues which. in their day, did a lot to link both the Dutch Antilles islands and former colony of Suriname. Dutch speakers living abroad now have other means to keep in touch with what's happening in the Netherlands. But analysis of the complex political affairs in the "Dutch" Caribbean? I think history will show that the conversation has stopped too soon. Holland will finally get DAB+ in the course of the next year. 40% coverage of the country with both commercial and public broadcasters. But I guess the community radio stations will be left out for the time being. I believe it's success will be linked to the user experience and the interface. Looking at other countries, like India and Nigeria, I see that a lot of listening to radio is actually using the FM chip inside their mobile phone. A separate device is no longer needed. The phone is also your access to social networks and a tool for doing business. Will the new iPhone 5 have a radio in it? Probably not. Are the handset manufacturers going to put DAB+ into cheap feature/smart phone I wonder? The one below costs 18 Euro in Mumbai, India. Elliot Stechman, a New Zealander living in Mumbai tells me they sell 250,000 of this model per month in India. Is it a secret meeting or what? IBC Publicity is sometimes difficult to understand. 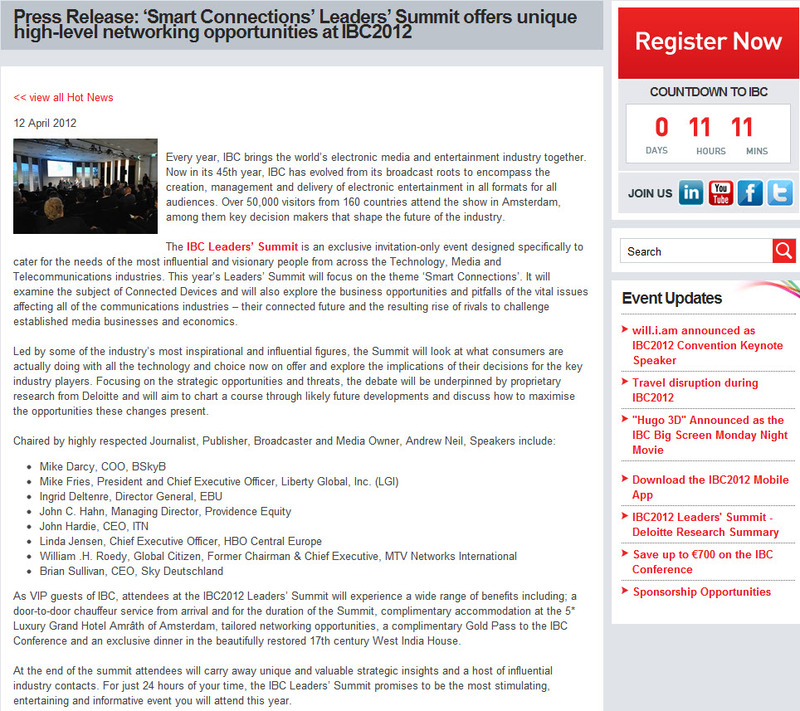 So today there's a VIP meeting of public and private broadcasters alongside the main IBC conference. Commercial operators can do what they like - I still have a choice to consume what they offer. But most Europeans have no choice as to whether they pay for public broadcasting. So all this elite gossip in the press release (dated 12th April but still presented as hot news on the website) seems very out of place during the worst recession to hit the broadcasting industry in decades. If it's a private affair - then why the publicity? If the sponsors are really doing it for press coverage (as a press release would imply), then beware of the Daily Mail and other publications who just love looking at the expense accounts of public broadcasters and can spot a junket from a thousand miles. "Exclusive", "complimentary accommodation", "door-to-door chauffeur" is not the language of public access and accountability. Summit seriously wrong here. Looking at tools for journalists in their work at radio stations. One simple plug in is called Rapportive. 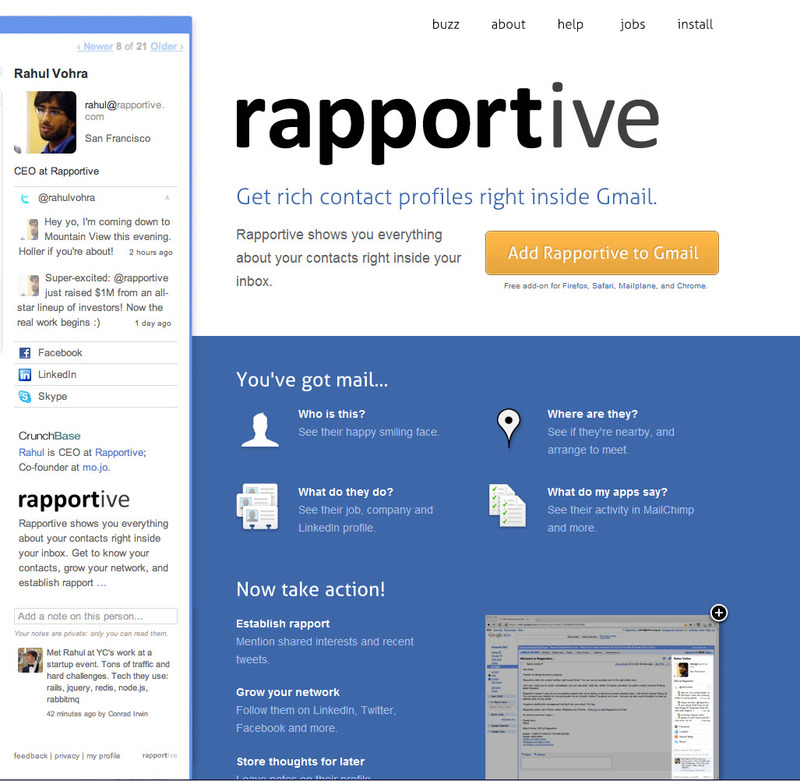 Gives you a profile of the sender instead of the ads in Gmail. Anyone know of other useful tools for this group of people? There are all kinds of lists out there. We love lists and rankings and comparing ourselves. 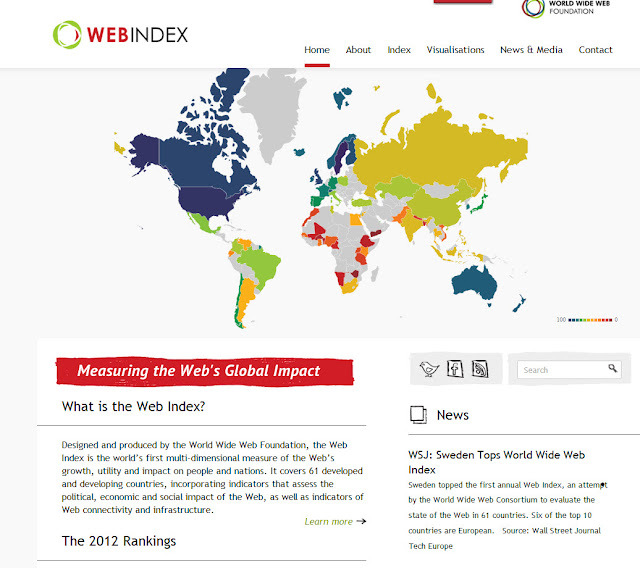 So who forgot to fill in the form in the Netherlands for the Web Index. I know the Dutch economy is less than rosy at the moment, but it's not often that Gitmo Nation Lowlands is left out altogether. James Cridland @ CMC Radio 2012 from iMMovator on Vimeo. Nice compact talk by James Cridland at the Cross Media Cafe in Hilversum. I like the video showing how people are using the radioplayer in the course of the day. Just been playing with the Interactive Floor Plan for the IBC Exhibition kicking off on Friday of this week. I find the interactive map rather clumsy - and I hate having to register. 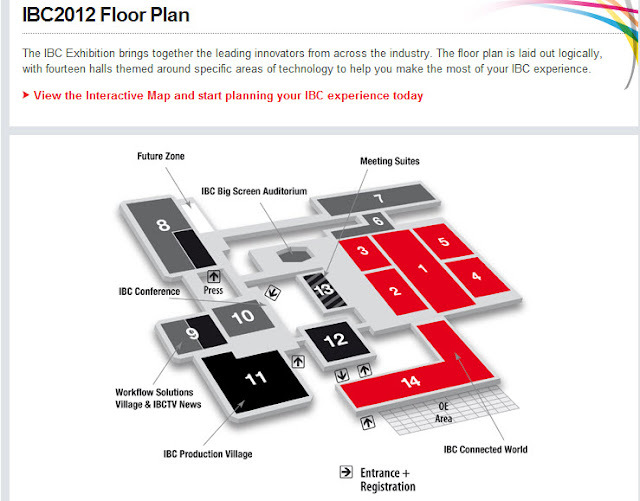 But it saves a lot of time knowing roughly where people are - IBC is a gigantic exhibition. I notice a lot of changes this year - people that have been in Hall 2 for years, for instance, now tucked away in Hall 7. And new names popping up as some rather familiar ones either downsize or disappear. So half an hour preparing will save a lot of time later. It will certainly be a different IBC this year. Curious. Will explore Hall 14 more this year.